I found a secret stash of elderberries this week. Now what’s a girl to do? 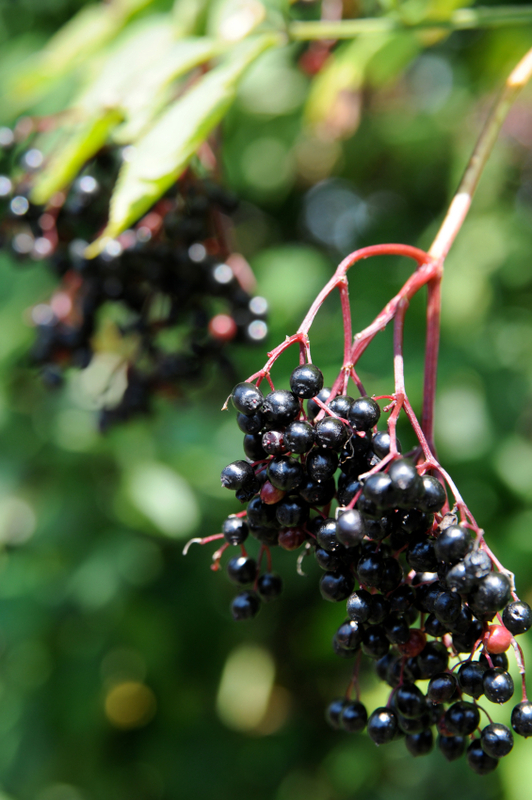 Despite the name – which sounds like a rather spiffing card game played for high stakes by bright young things – it is an elderberry sauce that has been knocking around since the seventeenth cetury. Now this really IS slow food. It takes time to mature and apparently keeps for seven years. Nothing lasts that long in this house. but if you can lay up a store for twelve months or so, it’s all the better. This recipe makes about 2 pints and is adapted from Pam Corbin’s recipe in the River Cottage Preserves handbook. Take all the elderberries off the stems using a fork. It’ll take a little while but is quite therapeutic. The stems are slightly toxic and the first rule of cooking here is ‘try not to poison anyone’. Put the elderberries into a casserole dish with the vinegar and cook at 130 degreesC for 6 hours or overnight. Strain through a sieve (to catch all the berries) and into a large bowl crushing the cooked berries with a potato masher to obtain as much juice as you can. Pour the sauce into a pot and add the remaining ingredients. Simmer gently for 25 minutes until slightly reduced. Strain one more time to remove the spices. Return it to the pot and bring it to a boil; let it boil for 5 minutes. Pour the hot pontack into warm, sterilised bottles and seal. Let cool and put in your pantry. Great with winter stews, especially pork and game or added to gravies.